The sub is still missing and now we are getting a timeline change! If I was suspicious of this incident previously- the changing timeline does little to ease my suspicions. 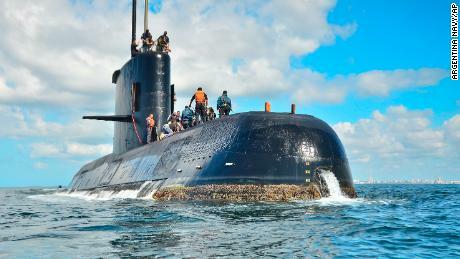 Yesterday: Argentina's "Missing" Sub- What's the Real Story? Ships and aircraft still are scouring the South Atlantic for the ARA San Juan and its 44 crew members, which disappeared November 15 a few hundred kilometers off Argentina's coast. Now we have a ten hour time difference.... from report to explosion. The Argentine navy had previously said the vessel's captain reported a short-circuit in the vessel's battery system shortly before the last known contact. On Tuesday, the navy released new details, including the times and contents of the vessel's communications with a command base. November 15, 12:30 a.m.: The sub's captain calls his land-based commander by satellite phone, saying that seawater has entered the vessel's "snorkel," a tube that reaches the surface to refresh the vessel's air and recharge the batteries. He says the water caused a short-circuit in the battery system in the vessel's bow and the beginnings of a fire, or smoke. The smoke was put out and the short-circuited system was isolated. The captain indicates that the battery- and diesel-powered sub would continue traveling with its stern batteries. 6 a.m.: The captain types the same message and relays it to base electronically, as is protocol following a phone conversation. 7:30 a.m.: The captain calls base again, this time to say that the vessel is traveling, submerged, as planned, without any personnel problems. 10:31 a.m.: A sound consistent with an explosion is detected in the ocean, near the sub's last known location. The Argentine navy says it didn't know about the explosion-like sound until last week, when the United States and an international organization said they had uncovered the acoustic data. There was no evidence of any attack and no information on the cause of the noise, Balbi said last week. There WAS NO evidence of any attack? As in at that time? Because, that's past tense talk. Has something changed? The San Juan had been traveling from a base in Argentina's far southern Tierra del Fuego archipelago to its home base in Mar del Plata, on country's northern coast. The sub was a few hundred kilometers off the coast when it disappeared November 15, roughly halfway between its departure point and destination. Crews from a number of nations are searching by air and sea for the San Juan in an area of roughly 40,000 square kilometers, Balbi said Tuesday. The time to find the crew with a viable air supply may have passed. The San Juan, if intact after an initial emergency, would have enough air to last seven to 10 days, if it remained fully immersed during that time, experts say. If the submarine surfaced or raised its snorkel to refresh its air, the crew could have bought more time. The 10-day mark was reached Saturday. Searchers don't know where the sub is, and no contact was made with the vessel after the morning of November 15, Balbi has said. "It's a difficult situation, but we will keep on searching," Balbi said Tuesday. The navy released the new timeline a day after Argentine TV news outlet A24 published what it said was the typed communication from the sub's captain to base on the morning the sub vanished. CNN's English translation of the message that A24 broadcast is: "Seawater leaked in through the ventilation system into battery system No. 3, causing a short circuit and the early stages of a fire where the batteries were. The batteries on the external bow are out of service. We are currently submerging with a divided circuit. Nothing new to report regarding personnel. Will keep you informed." Balbi's account of the sub's 6 a.m. message roughly matches the document that A24 broadcast Monday. But Balbi said he couldn't release a printout of the message, saying it was confidential. He called A24's document a "leak," and said the navy was investigating the leak. Who may have leaked the initial reporting of the seawater leaking through the "snorkel" and why? That initial leak /report made the incident seem as if the sub or it's crew were at fault for what occurred. That's definitely framing a specific narrative. What if that is not the case? Balbi said it is normal that some water -- from waves, for example -- would enter the sub's snorkel while it takes in air above the surface. A pump system usually can expel excess water. But, "if more water goes in than the pump can handle, that could be a problem," Balbi said. The sub would have had the capacity to travel with just one set of batteries, Balbi said, but would have done so at a slower speed, to reduce the number of times it would need to snorkel. Argentina's "Missing" Sub- What's the Real Story? Surveying the landscape surrounding the desolate bay on King George Island, 75 miles north of the Antarctic peninsula, Argentina's foreign minister Susana Malcorra gestures towards jagged outcrops of rock protruding from the snowy expanse. "As Antarctica becomes more relevant for the world, we have to strengthen our presence to protect our interests," she told accompanying journalists. "What happens to Antarctica happens to Argentina." Argentina first established a permanently inhabited base in Antarctica in 1904, almost a decade before Captain Robert Scott's fateful South Pole expedition. Its main foothold today is the Carlini research station, which undertakes scientific work including the effects of climate change on the region. Visiting Carlini, Ms Malcorra said the work of the base was vital to enforcing the 1959 Antarctic Treaty, which enshrined the vast territory as a scientific preserve. Argentina was one of the founding signatories of the treaty, penned at the height of the cold war as a conflict prevention tool, suspending all territorial claims and banning military activity. For now, commercial activity in the Antarctic is limited mainly to fishing and tourism - enforcement largely involves the use of satellites and naval patrols to keep poaching of the rich fishery stocks in check. But there are increasing concerns that nations such as Russia and China are looking at opportunities to exploit Antarctica's mineral riches, mirroring fears over the Arctic as melting sea ice opens up the historic Northern Sea Route between Europe and Asia and the possibility of oil exploration. "Who is to say what countries like Russia and China will do in 30 years' time? They might say 'we need these resources' [that are] in the Antarctic," said one diplomatic source. But Ms Malcorra's visit, the first to the Southern Ocean island by an Argentine foreign minister, was also aimed at assuring Argentines that the year-old government of Mauricio Macri, president, was serious about defending overseas territorial claims. The Macri administration has come under fire - even from influential members of his own governing coalition - for seeking to mend relations with the UK which have suffered from a dispute over the Falkland Islands, a British overseas territory invaded by Argentina in 1982. As a result of the Antarctic Treaty, the region has for decades been held up as a unique example in global co-operation. King George Island is home to a dozen international research stations, including China's Great Wall base and a Russian outpost with an ornate miniature Orthodox church, continually manned by a priest. Many would like matters to stay the way they are and ensure the region's resources are protected. 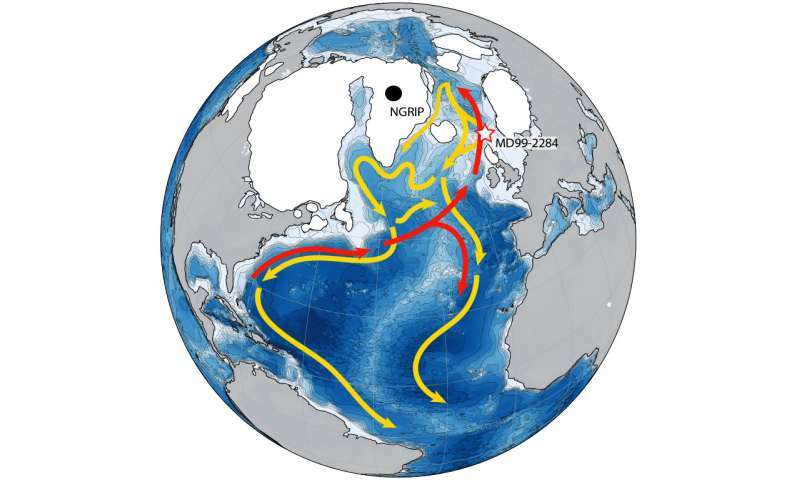 Last year, for instance, the Antarctic region's Ross Sea was declared the world's largest marine protected area. Máximo Gowland, head of Antarctic affairs at Argentina's foreign ministry, says science is "the paramount issue" in Antarctica. "Everything that is going on in Antarctica has to have a scientific basis to it, so all countries are basically revamping their Antarctic science," he says, adding that Argentina is keen to boost scientific investment. Nevertheless, the researchers working at the Carlini station are acutely aware of the geopolitical tensions that serve as a backdrop to their work. "Antarctica brings [science and politics] together, so that we do scientific research thinking also about politics," says Lucas Ruberto, who leads the team. "They are two different paths that find their common point in what we do here." Ms Malcorra insists her government is strengthening sovereignty in a "modern" way by defending the integrity of the polar region and of Argentine territory. She points out that while many Argentines think their country ends at Tierra del Fuego - which they call the "end of the world" - its southernmost province includes the Antarctic claims. To emphasise this, the previous government decreed that official maps show Argentina's Antarctic claims on the same scale as the rest of the country, rather than in a smaller-sized inset. "We have to preserve [Antarctic resources] and ensure they are managed in a way that does not affect the ecosystem," Ms Malcorra says, adding: "The wealth belongs to everyone, but an important part of it is ours." I'm going to be straight and say I don't know what the "real story" is! However, I've had that uncomfortable feeling about this incident since the story first broke. And that discomfort always appears when something is off.. When hubby first told me about this.. my first thought was ... Britain, the Falklands and Argentina. "The Argentinian Navy has revealed that the submarine that disappeared over a week ago vanished after water got into its snorkel and made a battery short-circuit." "An explosion was detected in the vicinity which could have been the vessel imploding"
Or not? How did the snorkel get damaged? Why couldn't the explosion have occurred before water got into the snorkel? Causing water to enter the snorkel? What is a snorkel and how does it work? Of course I took some time to read up on this! When the batteries need to be recharged, but the submarine wants to reduce its exposure to surface detection, it gets to a shallow depth and raises the snorkel. The submarine comes up to periscope depth, then raises the snorkel mast, which is essentially a hollow tube with a float valve on top (to prevent sucking in seawater). The diesel engine is then started, fresh air for the diesel is sucked down through the snorkel mast, and the exhaust is pushed by the engine . Was the sub damaged as it sat just below the surface of the water, with it’s snorkel raised? Could that have been the explosion heard? Repeating: The snorkel is a device which allows a submarine to operate submerged ( but not deeply submerged) while still taking in air from the surface. Something strange is going on with regards to the ARA San Juan, a 44-crew Argentine submarine that went missing on Nov. 15th. Put simply, I doubt Argentina's claim that it received reports on Wednesday and Thursday of underwater acoustic events recorded last week. Argentina says that the first acoustic report arrived from the Comprehensive Nuclear-Test-Ban Treaty Organization on Thursday, and the other report from the U.S. on Wednesday. Both reports, the Argentine navy says, match the time and location of the San Juan's disappearance last week. Argentina now believes an underwater explosion occurred. Sadly, it seems likely the boat has been lost with all hands. Still, as I say, the story doesn't add up here. First off, if a major abnormal, non-naturally occurring sound was detected on Nov. 15th, why did Argentina only find out about it today and yesterday? If a submarine explosion/implosion-magnitude sound was recorded, the data analysis devices employed by the CTBTO and the U.S. source (we don't know the identity of the U.S. detecting agency) would likely have registered it immediately. Even if analysts weren't looking for a sound in the area, their computer systems probably would have flagged the sound for further investigation. But let's assume that didn't happen and that the sound was recorded but not flagged for attention and thus sank into the storage files. Even then, it still doesn't explain why the Argentina was informed just yesterday about the sounds. After all, the moment the San Juan was reported missing on Nov. 17th, any organization possessing acoustic collection capabilities in the South Atlantic would have immediately scoured their data recordings for any evidence of an explosion. That process should have taken a matter of hours, certainly not a week. We now know the San Juan passed closer to the British Falkland Islands territory than previously believed. As I noted last week, this makes it likely the San Juan would have been monitored by the Royal Navy. Moreover, we must assume Britain has advanced acoustic capabilities reaching toward the location where the San Juan was last detected. That certainly seems more credible than the CTBTO — oriented toward detecting nuclear tests — somehow measuring the South Atlantic (there aren't many nuclear powers in that region). And there it is! The very issue that bothered me when this news first broke- The British Falkland Island Territories. According to the author of the above linked piece the San Juan passed closer to the British claimed territory then had previously been believed. What was the British reaction to this? We're they monitoring the sub? I believe they would have been! Considering that military grade acoustic systems are designed to detect a metaphorical pin drop in the ocean, it seems odd that the Royal Navy wouldn't have detected any major noise in that region. That leads me to lean towards two alternative conclusions about what's going on here. First, that the U.S. or Royal Navy detected the explosion last week and rapidly passed that information directly to Argentina. In this case, we must assume the Argentine navy kept their findings quiet in the hope of finding the San Juan or its wreckage. Now that they are declaring the reports, it seems clear they believe San Juan is lost. Second, that the Royal Navy detected the explosion and rapidly passed that information on to the CTBTO, for reasons of diplomacy or to avoid showing Argentina their detection capabilities. Regardless, I believe Argentina knew more earlier than it claims. I agree with the author that it's most likely the US and the Royal Navy detected this explosion immediately. But I do wonder if, particularly, the Royal Navy might have played a role in whatever occurred with the submarine. Never let a crisis go to waste? Or create a crisis and take advantage of the situation? An RAF aircraft has landed on Argentinian soil for the first time since the Falklands War to assist in the search for a missing submarine. The ARA San Juan disappeared 268 miles off Argentina's southern Atlantic coast last Wednesday and is understood to have had a seven-day supply of oxygen. As part of the UK's effort to help in the search for the Argentinian sub and its crew, an RAF Voyager carrying equipment and submarine specialists was dispatched to Comodoro Rivadavia. On its arrival in the southern Argentinian city, the crew were received by an Argentinian navy chief. Britain has spent £78 million protecting the Falkland Islands with a new missile defense shield also used by Israel, shortly after Argentina bought a new fleet of fighter jets. Argentina has long claimed what it calls the Islas Malvinas as its own. The new, souped-up defense shield is the product of Mprest, a company founded by former Israeli military officers. Mprest chief executive Natan Barak said the defense system would help make life on the Falklands safer. Barak praised the missile defense system, which will be integrated into Britain’s command and control system. “It also has to be capable of integrating with launchers and missiles. They will be able to operate and activate our system to fire on threats,” he added. 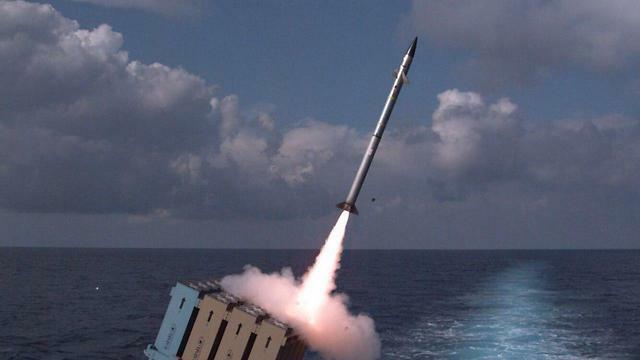 The maritime Iron Dome system was created to defend Israel's maritime economic water zone. The maritime model of the Iron Dome has also been synched with the "Adir" naval radar aboard INS Lahav, as well as with detection systems on the beach, with the two systems complementing and backing one another. Is Britain operating this system on the Falklands? Even if it's just testing Grad Rocket like projectiles to varying ranges? And the submarine is in the wrong place at the wrong time? Or not! Maybe it's too farfetched, but, maybe it isn't? Maybe some testing of the Iron Dome went wrong? Or not so wrong? After all the US has tested/fired missiles and brought down civilian airliners. As have others. So is it a stretch to wonder if the submarine was a practiced upon target? Just thinking out loud. "Syrian Kurdish PYD (PKK) forces sprayed a Turkish border post with gunfire late on Tuesday, wounding one soldier, and Turkey responded with artillery fire, private broadcaster CNN Turk said. The gunfire came from Afrin province in northwest Syria, it added. No further information was immediately available"
"At the moment, the US has not made any announcement that they intend to stop sending arms. On the contrary, they have voiced their intention to facilitate the cooperation with us and increase the volume of their aid to the SDF. This is their current strategy. We, in turn, also hope this support will continue," the SDF foreign affairs official told Sputnik. "QAMISHLO, Syrian Kurdistan (Kurdistan 24) – Officials in the Kurdish-led administration (PKK/YPG) in northern Syria on Thursday said they had begun preparing for the second local elections, a move toward consolidating a federal system in their regions. A member of the Election High Commission in Syria’s Kurdish-led administration told Kurdistan 24 there would be seven lists for the municipal vote for Federal administration in northern Syria. The lists represent the political factions in the region. One is called the Democratic Nation—which includes 18 political parties. The first round of elections was held in September for bodies running local communities, and in December for bodies running larger areas. Moreover, elections for the entire region of Syrian Kurdistan (Rojava) will be held in January. They claim the vote to establish a federal system has only been accepted by one political party." 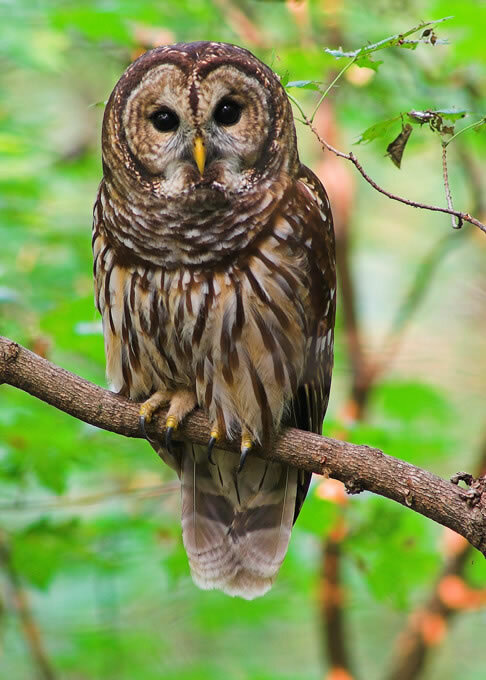 Both disgusting and insulting, a magnificent wondrous owl, is the representative chosen by internet tyrant Google to obfuscate their censorship. 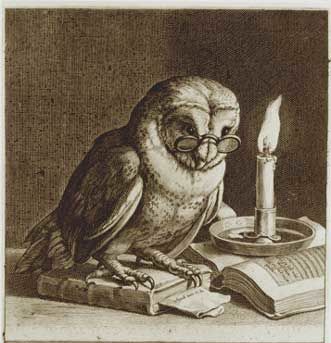 Google’s choice of an owl, as it’s project representative, maligns the very idea represented by the wise/sage owl. Obviously Google’s “programmers” understand the meaning of this archetype, which is why it was chosen by them to mislead the masses. Yes I use Google’s free blogging platform because free is what I can afford. I’ve noticed the past several months have seen new visitors to the blog drop away. The only search terms that direct interested persons to this place are ‘penny for your thoughts blog’ That’s pretty limiting. Gone are the days when ‘Syria news’ would bring a new reader. Or a search of some recent event would see a surge in readership, with some people staying on. The five eyes media is the progenitor of "FAKE NEWS"
It’s not that the truth isn’t contained, or cannot be found in the 5 eyes media reports. It’s that the presentation or context of that news is almost entirely fake. Fabricated. A lie. Or several lies. Lies, lies and lies overlapping and layered in order to obfuscate reality. You get the idea? Syria’s war was never a civil war. As for the Kurdish militias..?? They’ve got zero to do with tolerance, women’s right or any of that garbage- They're thugs backed by the US - Proxies for US backed terror- Their role as proxies for remake agendas cast doubt on the commonly presented 5 eyes media concept of the US as the saviour of the free world. So called “consensus science” is nothing more then bandwagon- Illogical thinking. Gadaffi’s Libya had the best standard of living of all African nations- Charles Manson didn’t kill anyone- At either theTate or La bianca home. All the above incorrect ideas, lies and fake news have been delivered faithfully to us all by the alleged authoritative media Google is directing the masses toward! It is the mass misinformer media, presented as the authoritative voice, that benefits from Google’s censorship of all other voices, opinion and views. Surely much of this is done as much to drive profits as to control the narrative. My blog, on the other hand is presently being marginalized by Google’s censorship. I’ve worked diligently on this blog for nearly ten years to bring credible & truthful information to the readership. I’ve done my best and believe I’ve delivered on what has always been the goal of this blog. And, for myself as a person who prefers truth to lies. A gal who always question the information and looks for a more sensible, truthful context to the facts I can actually parse out of all the malarkey, using my well honed critical thinking skills. What Google is doing is neither shocking, surprising or even new & different. It is in fact more of the same, except that now it's on a global scale! Google is the mass manipulator of the globalized organized habits and opinions of the global masses. That is a frightening thought! Google is sidelining all information save for that which serves a relatively small number of persons. I'm not endorsing World Socialist Website, however, if they have been shut out, as has Global Research here in Canada, I know that my fight is not a lonely one! Project Owl is not actually a project. By this, we mean that it isn’t a task with a start date and end date, it’s not a project that will one day be 100% complete. Project Owl is an official commitment by Google to continuously eliminate misinformation and improve its search engine and results. Google itself stated, “While our search results will never be perfect, we’re as committed as always to preserving your trust and to ensuring our products continue to be useful for everyone”. As long as there’s fake news on the Internet, Project Owl will be there to hunt it down. Soon enough this blog will be so obscured by the behemoth search engine that unless you have this site bookmarked... you will never land here. When no one can see or hear what it is you have to say, what ideas you wish to disseminate do you or I really have 'free speech" and the 'freedom of discourse" Is the internet really the free market of ideas? Google is certainly making clear that censorship rules. And we will all be worse off for this global impediment to our awareness and understanding of what is really going on. I’m thinking about twitter? Anyone? Funny, I just tested the search engine with that search text 'I’ve Got the Google Algorithm Blues- Project Owl' i.e. the title of this article. Result: no link to pennyforyourthougth2.blogspot.? from google. The article was listed from other blogs who had copy/pasted or simply syndicated via rss, but not your blog I checked the 5 first pages. I also tested on duckduckgo and there it was listed prominently as the first entry. Proof positive that your blog is censored by google. Thank You so much for taking the time to do that Gallier2! I could see it from the stats, but, your simple check makes very clear it is happening! A brief update on the Syrian Geneva Talks- You will notice the UN does not broach the subject of Kurdish militants sitting in annexed territory, filled with American bases. BEIRUT (Reuters) - A breakthrough in U.N.-backed Syria peace talks in Geneva this week seems hardly more likely than in seven earlier rounds as President Bashar al-Assad pushes for total military victory and his opponents stick by their demand he leave power. A Syrian newspaper reported on Monday that the government delegation would delay its planned Tuesday arrival in Geneva because of the opposition’s insistence that Assad step down. The stance is seen by Damascus and its allies as divorced from reality after their steady march of victories since Russia entered the war in 2015. The rebels have been forced from all Syria’s big cities and their hopes of toppling Assad by military means look finished. The opposition has also accused the government of refusing to seriously engage. “The Assad regime must not be allowed to play for time while people are being besieged and bombed,” Yahya al-Aridi, newly appointed head of the opposition’s negotiating committee, said on Sunday. Aridi was chosen last week after the opposition rejigged its negotiations committee - jettisoning as its head a more hardline opponent of Assad in what some speculated might be a move towards softening its position. But the statement it put out after meeting on Friday reiterated its demand that Assad go before the start of a political transition under any peace deal. Last week a senior Assad adviser said talks could succeed only if rebels laid down their arms. Over the weekend, air strikes on the rebel-held Eastern Ghouta district near Damascus intensified, killing 34 people on Sunday and Monday, according to a war monitor. “You cannot expect very much,” said Nikolaos Van Dam, a former Dutch diplomat in Damascus and author of two books about Syria. “The regime doesn’t want to really negotiate. They want to reconquer every inch of Syrian territory and then negotiate. But then the opposition would have no bargaining chips,” he said. The Syrian civil war, now in its seventh year, has killed hundreds of thousands of people and caused the world’s worst refugee crisis, driving 11 million from their homes. All previous diplomatic initiatives have swiftly collapsed over the opposition demand that Assad leave power and his refusal to go. Troops from Russia, Iran, Turkey and the United States, as well as Shi‘ite militias from Lebanon, Iraq and Afghanistan have all been brought to Syria. Russia has pushed its own parallel track of diplomacy since early this year, bringing together Assad’s other main ally Iran, and Turkey, which has been one of the biggest rebel supporters. Russia has elections next year and President Vladimir Putin wants to show progress towards a political deal after two years of fighting far from Russian soil. Moscow has already said it will bring many troops home from Syria by the end of the year. Putin may also seek to tout diplomatic progress as he angles for the West to take some of the burden of Syria’s post-war reconstruction, now likely to fall on Russia, Iran and China. Western foreign ministers said in September their support hinges on a “credible political process leading to a genuine political transition”, a process they have said requires the involvement of the opposition. “Russia wants the end of the war but it wants its ally intact. So what would be the compromise that is acceptable to the opposition or to the other countries? It’s not clear to me,” said Van Dam. Moscow now plans a “Syrian Congress”, bringing together the government and some opposition groups to write a new constitution leading to elections. The main opposition rejects the idea, saying all talks must come under the United Nations. But the government has said it backs the congress, as has Turkey, which has some sway over rebel groups in the northwest. “There is an acceleration in the political solution on the basis of a unified Syria headed by Bashar al-Assad, with amendments to the constitution and in the election law,” a senior, pro-Assad official in the region said. The Syrian government declared on Sunday it would support the formation of a committee that will discuss the constitution and is expected to be set up at the congress. It also said it would support U.N. participation in legislative elections to be held after that discussion. This week’s Geneva talks will focus on the issues of elections and a constitution, Ramzi Ramzi, the deputy United Nations special envoy for Syria said in Damascus on Saturday. What a swell offer, from a good bunch of joes! The UK/Usrael, cohorts and proxies waged war against Syria. The Kurdish thug/proxies employed by the UK/USrael have now said they will join the Syrian Army, if they get their own federal state. UK/USrael waged war in order to bend the will of Syria to that of their own. As for the PKK/YPG kurds arrogantly suggesting this after all the death, displacement and destruction of Syria they have sown?! You only do that if you got some solid backing! The Kurdish-led Syrian Democratic Forces (SDF) have no problem joining the Syrian army if a federal state is awarded to the Kurds in northern Syria, a senior Rojava official said on Sunday. Rezan Gilo, the joint chief of defense in Syrian Kurdistan (Rojava), told Kurdistan 24 the SDF, which is led by the Kurdish People’s Protection Units (YPG), would consider joining the Syrian army. “There is no problem for our forces to join the Syrian army if a new Syrian constitution is drafted on a federal basis and the rights of all the Syrian components are reserved,” Gilo stated. In an earlier interview, the joint president of the Syrian Democratic Council, Riad Derar, said that when a political settlement is achieved in Syria, the SDF would join the Syrian army. “If our plans to form a federal state [in northern Syria] are accepted, then our forces will join the Syrian national army,” Derar told the media. Analysts believe if the SDF ever join the national army, it would be under American supervision and guidance. Which means the US will keep pushing to oust Assad. The feeling of disgust overwhelms my person. The news regarding more then 2,000 US Troops present in Syria- alongside this latest leak from the US backed “SDF” aka PKK/YPG mentioning a total of 4,000 troops, all coming to the fore ahead of the Geneva talks this Tuesday November 28/2017?!?! Can that be a coincidence? I think not! Should we expect an announcement of the US intent to "keep the peace" through this transitional period? Will Syria be federalized? Will the annexed Syria territory fully armed and occupied by the US and PKK thugs be legitimized? It's all in the presentation boys and girls.... We'll see where the cards fall this week. The office of the UN Special Envoy for Syria Staffan de Mistura on Saturday issued a latest statement in Geneva, showing that they are getting ready for the new round of the intra-Syrian peace talk which is expected to kick off next Monday. Ramzi Ezzedine Ramzi said four baskets would be under discussion in the eighth round of Syrian talks in Geneva slated for November 28, adding that the focus will be on the second and third baskets, pertaining the elections and constitution. If the White House statement about “stability of a unified Syria” means that Trump has accepted Assad's rule, then he has made a huge mistake. The president, Congress, and the State Department should speak out against Russia's rigged diplomatic initiative, ensure that future peace talks allow the legitimate opposition real agency to make decisions, and demand implementation of the Geneva II Communique that was endorsed by the U.S. and Russia calling for Assad's departure. Shlomo Bolts is the Policy and Advocacy officer at the Syrian American Council. Here's the reveal of the 4,000 troops present alongside PKK/YPG aka "SDF"
A source from the Kurdish-led Syrian Democratic Forces (SDF) has revealed that thousands of military personnel of the US-led Global Coalition are present in Syrian Kurdistan and other northern regions of the country. “Nearly 4,000 troops and military advisors of the anti-Islamic State Global Coalition are present in Syria. Besides Americans, there are also German, British and French troops,” the source told BasNews, seeking anonymity for security reasons. No mention of Israeli's but you know they are present! He confirmed that the Coalition troops have been actively fighting alongside the SDF fighters against the Islamic State militants. The Coalition forces have set up more than 10 military installments and airbases across the Syrian Kurdistan (also known as Rojava), according to the source. He pointed out that the Coalition personnel, apart form fighting the Islamic State, provides the SDF forces with military training to help them with their battle against (resident Syrians) extremist groups. Two unnamed US officials previously said the Pentagon is likely to announce in the coming days that there are about 2,000 US troops in Syria and not 500 as it was stated before. The "federalization" of Syria is a done deal. Bashar Assad knows this. Russian leadership knows this as well. The USrael isn't going anywhere. And the fighting will still not end! The presentation should be quite an exercise in mass perception management. This admission will not surprise anyone who reads here. The real question is why admit this at this time??? The answer is, quite obviously, that the US is going to stay firmly placed in Syria. They are prepping the masses in advance of their long planned occupation of Syria. In plain talk: US to REMAIN in ethnically cleansed/illegally/criminally annexed portion of Syria- permanently. As the regional remake continues on. If you have read here for the past 3- 4 years you would be aware this was the plan. It was not a happenstance or a random occurrence. Regional remake. Creating a weaponized refugee outflow. Creating an Israel 2.0 for the benefit of Israel 1.0. Accessing water and energy resources for purposes of total control. And profit. All in plain site. The Pentagon is likely to announce in the coming days that there are about 2,000 U.S. troops in Syria, two U.S. officials said on Friday, as the military acknowledges that an accounting system for troops has under-reported the size of forces on the ground. The U.S. military had earlier publicly said it had around 500 troops in Syria, mostly supporting the Syrian Democratic Forces group of Kurdish and Arab militias fighting Islamic State in the north of the country. Two U.S. officials, speaking on the condition of anonymity, said the Pentagon could, as early as Monday, publicly announce that there are slightly more than 2,000 U.S. troops in Syria. Several prominent Jews in Europe and North America joined an organization fostering Jewish-Kurdish friendship and supporting independence for Iraqi Kurdistan. The Jewish-American lawyer Alan Dershowitz joined the honorary board of the Brussels-based Jewish Coalition for Kurdistan last month, along with Irwin Cotler, a former justice minister of Canada, and Serge and Beate Klarsfeld, two well-known hunters of Nazis from Germany, the group’s founder and president, Joel Rubinfeld, told JTA Wednesday. "Cotler, who has been nominated by Prof. Alan Dershowitz for this year’s Nobel Peace Prize, was one of six recipients of honorary doctoral degrees conferred by Ben-Gurion University of the Negev"
"Also on the honorary board of the coalition are Rabbi Abraham Cooper, the associate dean of the Simon Wiesenthal Center, and Charles Tannock, a British lawmaker at the European Parliament and foreign affairs and human rights spokesman for the UK Conservative delegation. 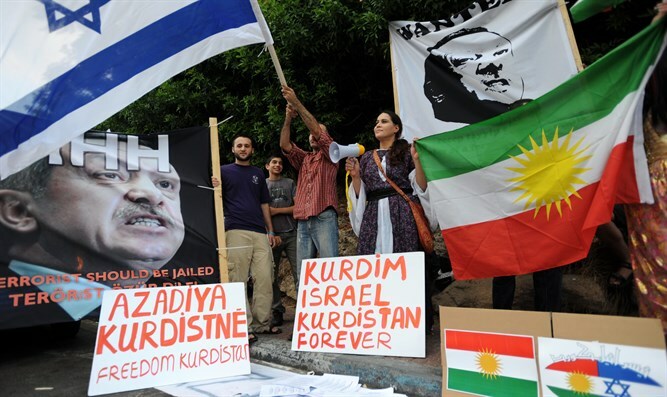 The unveiling Wednesday of Rubinfeld’s group is among several high-profile actions in support of Kurdish national aspirations by Jews following the September independence referendum in Kurdistan, the autonomous region in northern Iraq. On Friday, Bernard-Henri Lévy, a French-Jewish philosopher and longtime supporter of Kurdish independence, will attend a screening at the United Nations headquarters in New York of his documentary film on the subject titled “Peshmerga,” which is the Kurdish-language name of the Kurdish combatants. Levy is not a member of the Jewish Coalition for Kurdistan. Rubinfeld is a former president of the federation of French-speaking Jewish communities of Belgium and founder of the Belgian League against Anti-Semitism. He unveiled the pro-Kurdish group while in Israel, where he is slated to attend a first-of-its kind conference on Kurdish independence at Israel’s Knesset. Scheduled for Nov. 29, the 70th anniversary of the successful vote on the UN Partition Plan for Palestine, the event is titled “Kurdistan and Israel: Together Toward Peace and Stability in the Middle East.” The conference is being organized by Zionist Union lawmaker Ksenia Svetlona. In addition to Israeli lawmakers, members of the Kurdish Jewish community and activists like Rubinfeld, Kurdish civil society leaders also will attend. “It’s natural that such an event should take place in Israel, which is today the best ally of Kurdistan today, and perhaps its only one, unfortunately,” said Rubinfeld, who began lobbying for the Kurdish national cause two years ago. “There is widespread understanding of the rightfulness of the Kurdish cause and its strategic importance” in Israel, he added. When you consider the reality of the push for a "Kurdish state" then yes, it is very natural that this event takes place in Israel, on the day it is set to take place! Considering the importance to Israel, in creating this state, as an expansion of Israel - it should be clear to all why I wrote the posts suggesting it is way too early to call the demise of Kurdistan ! Way too early to make that claim, sorry folks! Israel was among the first countries in the world to support the establishment of a Kurdish state following a statement on the issue by Prime Minister Binyamin Netanyahu. Israel in the past had remained silent on Kurdish national ambitions, which Turkey, a major trade partner of Israel and previously also a key ally, has long opposed. Iran is widely seen as dictating various policies and actions of the government of Iraq. “The Peshmerga were abandoned by the United States under Donald Trump,” charged Rubinfeld. Following clashes between Kurdish Peshmerga soldiers and Iraqi Security Forces in the northern Iraqi city of Kirkuk in October, President Trump said he is “not taking sides.” The State Department said it “strongly opposes” the referendum on independence, preferring a dialogue facilitated by the United States and United Nations. Iraq’s parliament in Baghdad voted last month to criminalize flying the Israeli flag in the country, after they appeared at several Kurdish rallies in the lead up and aftermath of the referendum. Both people stand up for what they label as western values such as destabilization, ethnic cleansing, intolerance and supporting fanaticism to the extreme? While destroying nations, culture and history. These are not my values and I'm from the so called west. Since they don't stand for me or my values.. then I cannot accept their claim- It's as simple as that! I'm not certain how sovereignty is being defined here, but, nonetheless, that's the claim. "Turkey, Russia and Iran have reiterated their support for Syria's sovereignty and territorial integrity. "The heads of state reaffirmed their strong commitment to sovereignty, independence, unity and territorial integrity of the Syrian Arab Republic," according to a joint statement released following a trilateral meeting between the presidents of the three countries Wednesday. The presidents called on “the representatives of the government of the Syrian Arab Republic and the opposition that are committed to the sovereignty, independence, unity, territorial integrity and non-fractional character of Syrian state to participate constructively in the Syrian National Dialogue Congress in Sochi in the near future", it added. "The presidents expressed satisfaction with the current level of tripartite coordination on maintaining and strengthening the cease-fire regime in Syria, of which Iran, Russia and Turkey are guarantors," it said. "The presidents emphasized that the creation of the de-escalation areas established in Astana process in Syria have been quite efficient and greatly help to reduce violence, alleviate the humanitarian suffering, curb the flow of refugees, and start working to provide conditions for the safe return of refugees and internally-displaced persons," it added. "The presidents decided that Iran, Russia and Turkey would continue their coordinated efforts to ensure that the progress in reduction of violence is irreversible. "They agreed to assist the Syrians in restoring unity of the country, and achieving а political solution of the crisis through an inclusive, free, fair and transparent Syrian-led and Syrian-owned process, leading to а constitution enjoying the support of the Syrian people and free and fair elections with the participation of all eligible Syrians under appropriate un supervision," it added. The leaders also underscored the need for "rapid, safe and unhindered" humanitarian access to Syria. They also called on the international community to support the process of de-escalation and stabilization in the country." The warm and cordial welcome extended to the Syrian president by Vladimir Putin and senior Russian officials — mainly generals led by the Minister of Defense, Sergei Shoigu, who were taking part in defense-related talks — sends strong signals that, for Russia, Assad is not only part of the solution for Syria, but also a legitimate leader who the Kremlin expects to stay in power for some years. I couldn't help but notice Kurdish media is presenting a concept that Iran has expressed no real concerns about border changes... Sure reads to me as if they have! And this is not a first. "Putin and Rouhani did not mention the Kurds" Oh, really? Rouhani- "attempts to change geographical borders in the region would eventually fail; and that American and Israeli interference would not produce their desired results" Clearly a reference to the US/Israel backed Kurds. From the same Kurdish media article:"A top commander of the Kurdistan Workers' Party (PKK) which Ankara views as the parent organization of the YPG this week called on Putin to deny Ankara green light for any (Afrin) operation"
Before his departure for the Black Sea resort of Sochi, the Iranian president said any attempt to change geographical borders in the region will fail, vowing the Islamic Republic’s resolve to continue its fight against terrorists until their eradication. Rouhani further expressed hope that the Sochi summit will help pave the way for the Syrian nation to build a “good future,” Press TV reported. He also hailed the victories of Iraqi and Syrian nations in the face of terrorists, highlighting the role of Iran and Lebanon’s Hezbollah resistance movement in the regional fight against terror. “These achievements do not mean that the issue of terrorism and Daesh no longer exists. But [the terror group's] foundations have fallen apart,” which means it does not control any territory where it can claim statehood. He said Iran knew from the very first day that using terrorists by certain states as a tool to push their own agendas would never succeed; that attempts to change geographical borders in the region would eventually fail; and that American and Israeli interference would not produce their desired results. The Iranian chief executive voiced concerns about the security situation in the Middle East, and criticized attempts by Washington and Tel Aviv to fan the flames of tension in the region. 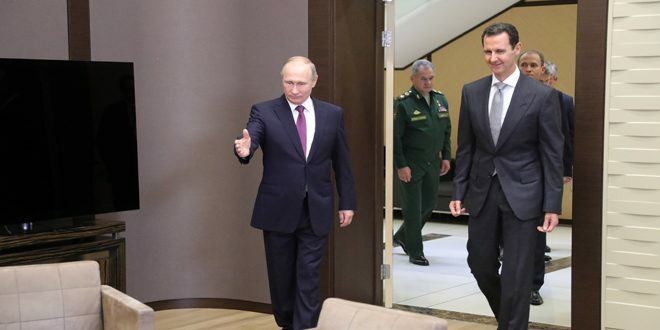 Sochi, SANA- President Bashar al-Assad held a summit meeting with Russian President Vladimir Putin in Sochi City in the presence of senior Russian political and military officials, during a work visit he paid to Russia on Tuesday. President Putin congratulated President al-Assad on the successes achieved by Syria in the framework of combating terrorism and on approaching victory over terrorism. Putin underlined the importance of the timing of the visit in increasing coordination between the two sides, holding additional consultations, and listening to the assessment of the Syrian leadership on the situation in Syria and on the shape of the next steps as well as its vision on the political process and the role of the UN in it before the summit during which he will meet his Iranian and Turkish counterparts in Sochi, Russia. For his part, President al-Assad thanked President Putin for the warm welcome, saying that this meeting comes after two years and few weeks from launching the Russian military operation which supports the Syrian Arab Army in its war against terrorism and which has made significant achievements on different levels, on top, the humanitarian, military and political levels. President al-Assad indicated that the victories achieved against terrorism led to the return of security to many areas and subsequently, citizens returned to them and the wheel of normal life began to move again, in addition to pushing the political track forwards to find solution to the crisis in Syria. President al-Assad clarified that the Russian policy has been active on different axes and all of them are important, particularly through affirming the necessity of the UN adherence to its Charter which asserts the sovereignty of the states and the noninterference in their internal affairs and the right of the nations to decide their destiny. He underlined the importance of this meeting to coordinate on the highest levels between the two sides on different issues which the two countries are interested in including the continuation of combating terrorism, the exerted efforts with regard to the political track, the national dialogue congress and the next tripartite summit in Sochi. President al-Assad asserted that what is important today is to stop the bloodshed, and that Syria is ready to work with any country ready to contribute to the political solution as long as it is based on the Syrian sovereignty and the Syrian decision. His plane touched down at Beirut international airport shortly before midnight, a statement from his office said. Hariri had promised he would return to Lebanon in time to mark its 47th independence day on Wednesday and would clarify his position. On Tuesday he travelled to Cairo to see the Egyptian president, Abdel Fattah al-Sisi, whom he thanked for his support for Lebanon. Hours later Hariri flew from Cairo to Larnaca in Cyprus where he met late at night with President Nicos Anastasiades, said a Cyprus government spokesman. After a brief visit he flew on to Beirut where he is expected to take part in the independence day military parade early on Wednesday and the customary reception at the presidential palace. Questions remain over whether the resignation will stand, forcing negotiations on a new government, or if he might withdraw it. Under Lebanon’s constitution the president is bound to accept a premier’s resignation however it is tendered, according to the Lebanese constitutional expert Edmond Rizk. Although it is not outlined in the constitution, Rizk said, custom dictates “this resignation is supposed to be submitted to the president of the republic”. A resignation brings down the government and the president then engages in consultations to select a new prime minister to form a cabinet. In Lebanon, divided for more than a decade between a pro-Saudi camp and a Tehran-backed alliance, that process typically takes months of political wrangling. But the discussions also aim to strike a balance between the country’s diverse religious communities. As part of Lebanon’s presidential-parliamentary system, the premier must be a Sunni Muslim, the president a Maronite Christian and the speaker of parliament a Shia Muslim. More than a week ago Hariri said he could walk back from his resignation if Hezbollah withdrew from regional conflicts, including Syria. Hezbollah, whose forces are fighting in neighbouring Syria along government troops, has said it still considers Hariri the current premier. “When he comes we will see. We’re open to all dialogue and discussion,” its chief, Hassan Nasrallah said on Monday. But if Hariri stands firm Aoun has two options: either rename him premier or choose another prominent Sunni figure to lead a new cabinet. “If Hariri’s consultations lead to a new government, that would be a way out,” said Rizk. Aoun tipped Hariri as premier in 2016 as part of a deal across political lines that ended a two and a half year stalemate in Lebanon. Hariri’s two terms as prime minister have both ended abruptly. In January 2011, as he was meeting with then-US president Barack Obama in Washington, Hezbollah and its allies withdrew their ministers and collapsed Hariri’s government. His unexpected resignation earlier this month was seen as part of an escalating power struggle between Sunni Saudi Arabia and Shia Iran, which back opposing sides in the conflicts in Syria and Yemen. Trudeau Government's "Returning Terrorist Integration"
Saad Hariri Accepts Exile in France? Or Not? BBC Tells "Raqqa's Dirty Secret"
US Sends Even More Weapons to YPG/PKK aka "SDF"